Set on a private 5-acre lot – adjacent to the gorgeous Mountain Cascades Lodge (also on a private 5-acre lot) – Eagle River Lodge is a stunning 6-bedroom, 7 ½-bathroom mountain lodge with space for 24 and an impressive list of amenities. Each space in this industrial-style cabin has been beautifully designed, from the stone-and-long exterior and incredible indoor pool room to the elegant entryway and gorgeous game loft. No detail has been overlooked! Whatever group vacation you’re planning – family reunion, church retreat, wedding weekend, girls’ getaway, big family vacation, or weekend with friends – Eagle River Lodge has the space, amenities, and style to make it a great one. The fully equipped kitchen features double appliances, the living room boasts soaring ceilings and lots of comfortable seating, there are dining tables inside and outside, and the bedrooms are their own little retreats within the cabin. Add to those conveniences perks like the amazing private indoor pool (with a mini yard, waterfalls, and lighting effects), a game loft with a big screen TV and a pool table, an Xbox One, a theater room, flatscreen TVs in the bedrooms, and a foosball table, and you have a luxurious mountain lodge that’s outfitted for days of fun and relaxation. On top of everything you’ll find inside Eagle River Lodge, this Pigeon Forge cabin is less than 5 miles from downtown Pigeon Forge. Within a short drive, you’ll be in the heart of it all, with access to dozens of restaurants, fun attractions, outdoor adventures, dinner shows, outlet stores, local boutiques, cafes, candy stores, and more. When you’re done exploring, you can head back to your private lodge for relaxing nights rocking on the porch, grilling, and enjoying tree-studded views. A beautiful entryway greets you in Eagle River Lodge, complete with custom wood carvings, a shiplap-style bark wall, stone details, and a log bench. Step inside, kick off your shoes, and get ready for some much-needed rest and relaxation in the Smokies. Once you step through the entryway, the spacious yet cozy living room awaits. Lots of mountain details make up the unique space, from the stacked stone fireplace that runs all the way to the ceiling and the huge log beams to the reclaimed-wood panels and national-park-themed blankets. Three cozy sofas flank the gas fireplace where the big screen TV hangs. Lounge around to watch ball games and TV or grab a drink and some snacks to set out on the coffee table. With comfortable seating, a cozy fireplace, a big TV, and huge windows that frame tree-studded views of the Smokies, the living room is the place to gather with family and friends to chat, watch your favorite shows, and just unwind after busy days exploring Pigeon Forge or hiking in the Great Smoky Mountains National Park. Eagle River Lodge features a beautiful fully equipped kitchen where you can make group meals, store leftovers, set out a spread of game-day snacks, or set up a catered meal. It has more of those gorgeous details that you’ll find throughout the cabin, including tin ceilings, natural-wood cabinets, reclaimed-wood panels, and granite countertops. It’s also outfitted with plenty of dishes, glassware, and utensils when you want to have meals in the cabin. When you’re ready to cook, take advantage of 2 ovens, 2 built-in microwaves, 2 refrigerators, 2 dishwashers, 2 sinks, pots and pans, cooking utensils, and ample counter space to prep. It’s a bright, inviting space where you can bake cookies, whip up meals, and make holiday favorites. You’ll even have a lovely little window over the sink to enjoy wooded views while you get dinner ready. An awesome kitchen calls for a great dining space, and Eagle River Lodge offers just that – inside and out. In the dining room, just off the kitchen, you’ll find 2 large log tables with a mix of chairs and benches. Large windows give you wooded views while you dine, and you’ll have easy access to the outdoor dining area via the deck doors here. On nice days, take your plate out to the dining table on the covered deck for a meal with a side of mountain breezes. Vacation just isn’t vacation without a little fun when you’re hanging out around the cabin. At Eagle River Lodge, a game loft ensures entertainment for kids and adults, whether it’s a rainy day, a lazy afternoon at the cabin, or a laid-back game night. With exposed wood beams and reclaimed wood above, the living room open below, and the tree-studded views on each side, the game loft is open, bright, and features more of those industrial-style details. Hang out here to play pool, play a game of checkers, bust out your favorite board games, or lounge on the plush sofa and chairs in front of the big flatscreen TV. An Xbox One adds some more fun, so bring the kids’ favorite games! The private indoor pool - at 87 degrees for comfort - at Eagle River Lodge is a stunner. The large room features beautiful wood ceilings, log pillars, and a cool stone floor. Along one wall, a stacked stone waterfall serves as a feature and fun place to hang out. You’ll find another waterfall on the other side of the pool, and in the center is a little yard! Walk along the log bridge to the green island, where you can lounge in the chairs while the kids splash around. The pool even has special lighting effects and a new salt-generating chlorine system! Around the pool, find lots of Adirondack lounge chairs and hooks for pool towels. In its own little corner, you’ll have a dining table and chairs, along with a big screen TV. You can flip on a ball game while you swim or let the kids pop in their favorite cartoon while they play! 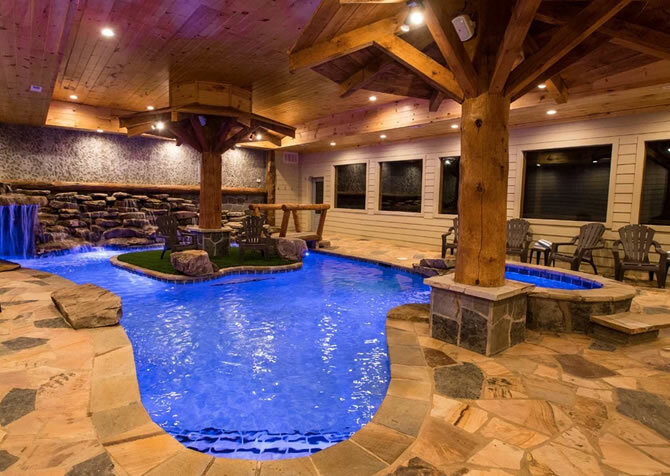 With such a great indoor space, you can swim year-round, no matter the weather. And with a table and TV, you can bring a board game or some cards and play while others splash around. Each of the bedrooms in Eagle River Lodge is a retreat within this spacious retreat. Six comfortable bedrooms give you space for 24 guests, with king-size beds in 5 bedrooms and 2 full-size bunk beds in the other bedroom. All the bedrooms have their own TVs, and with 7 ½ bathrooms, there will be plenty of space for everyone to get ready before heading into town or calling it a night. You can’t take a trip to the Great Smoky Mountains without spending at least a little time in the great outdoors. You don’t even have to leave the cabin for outdoor time when you stay at Eagle River Lodge. The covered deck gives you a place to enjoy the peaceful wooded surroundings without worry about the weather. Sit down in the rocking chairs with a good book or a drink, fire up the grill for a cookout on a cool mountain evening, or take your plate outside and enjoy a meal at the 6-person dining table on the deck. Surrounded by the trees, it will be the most peaceful table you’ll find among the dining options in downtown! You’ll also have an outdoor hot tub where you can climb in and soothe tired muscles. After long days exploring the Smokies, it will be much appreciated! When you’re away from home, little things make a big difference. At Eagle River Lodge, you’ll have wireless internet to keep you connected, and a washer/dryer in the cabin makes it easy to wash swimsuits, dry towels, or to have all your clothes clean before heading home. It also offers a paved driveway for easier parking and a Blu-ray player if you have some favorite movies you want to watch! With The Escape Game, a show fountain, Ole Smoky Moonshine, live music, boutique shops, celebrity-owned restaurants, a ropes course, and lots of great candy and dessert spots, The Island has something for everyone. From roller coasters and kids’ rides to musicals and carnival games, Dollywood is a one-stop attraction for all ages. Plus, they host fun events throughout the year that showcase cultures from around the world, food, music, and more! Fly high above the forest floor at Smoky Mountain Ziplines, where you’ll get your blood pumping, have fun with family and friends, and get great views of the Smoky Mountain forest.